My first car was a 1973 Malibu. I bought it used in 1978. It was a two-door with vinyl roof, swivel bucket seats, and and 8-cylinder engine that spit out 350 hp. I often lie and say it was a four-barrel engine, when in fact it was only two. I have no clue what that means. 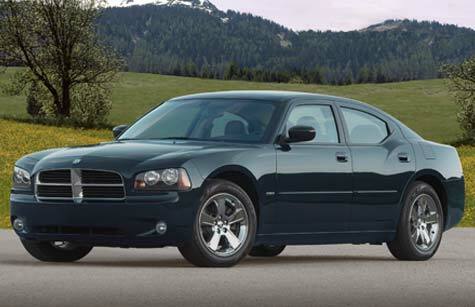 Driving the Charger brought me back to the heady days of big power, rear wheel drive, and high fuel consumption. This muscular car made me feel like a guy. I could almost feel 'em growing back after 3 decades of driving emasculating front-wheel drive cars. Good - you feel like a guy again. It feels a little dangerous. It has a serious, almost a "mean" face to it (as opposed to happy-faced mini-vans and compact cars). The rear wheel drive feels powerful and tough. You strut when you walk towards the car. Great - all of the above, and more. The car is smooth on the highway, and reasonable on gas considering... It's roomy, simple, and the controls are easy to read, understand and use. There are no distractions and it's far from boring to drive. Room for Growth? It's pretty basic at the level I was driving, but that is also it's strength. It's a throwback to the 70s in its simplicity, and yes I know it's loaded with computers and gadgets that hadn't been invented in the 70s. They're out of the way, and the cockpit is simple and a very cool no-frills experience. If I could add one thing, it would be a trip computer that showed fuel consumption, a compass, upscale sound system controls...but I can live without all that. But Would I Buy One? If I did a LOT of highway driving, this would be a very cool car to do it in. For the second time in as many weeks I arrived to pick up my rental car and found it at somewhat less than a full tank. The tank was at 3/8 full (or 5/8 empty). Because of that, the manager refused to let me purchase my usual option of pre-paying for a full tank and returning the car empty. He argued economics - he wasn't going to let his team fill it up at $1.10 per litre and sell it to me at the pre-paid price of $.94. And yet, that's the very nature of the deal. I asked superstar manager about this new procedure, he called it policy. Upon further investigation, he admitted it's HIS policy at HIS store and it's been that way for about 3 weeks (probably really more like two months, he just doesn't want to admit that). It's not company-wide or industry-wide, it's his store. Two things - first, it's a basic rule of car rental that you ALWAYS depart with a full tank and bring the car back full. It's been that way since I rented my first Volare at Tilden in 1979, and probably long before that. The second thing is that when I rent a car locally, my nearest appointment is at least 200 km away. I don't care about the economics of pre-paying a full tank; this isn't about saving a buck. It's about convenience and good service. About an hour into my trip I had to find a highway gas station and fill the tank at inflated highway prices. So why has he has implemented this policy? Here's my considered opinion. When he stopped filling up the tanks on all pre-paid rentals that came back near-empty (probably starting back in December), he saved hundreds or thousands of dollars in fuel expense. The bottom line looked pretty good that month, probably just in time for year-end. The manager probably got a bonus, and he seems to have received a promotion. He's moving to a bigger metropolis next week. Here's the mess he's leaving behind - I am now looking for an alternative rental car company to deal with. His replacement manager will be saddled with the expense of filling up the fleet (higher expenses) and a regular customer is fed up and actively seeking another company from which to rent (lower sales). And everyone will wonder why the replacement just can't deliver the bottom line like his predecessor could. Oh, and I've shared my concerns with the manager, but I think they fell on deaf ears. Deacon Greg Kandra blogged this piece on Humility, and I share it with you. Thanks to Mitchell Beer for sharing it.